It’s with a lot of pride that I introduce you to Geneviève Beaudoin, whose name you’ll surely be hearing again. I met Genny when she walked into my classroom in May of 2007, a polite and wide eyed eighth grader visiting my high school social studies classroom on Step Up Day. She was an exceptional student in my Ancient World Cultures class as a ninth grader in the fall—a true scholar who saw connections between the past and present and understood how and why to glean lessons from the past. I was thrilled to have her. I have never been more impressed at a school musical than I was when I saw her as the lead in Once Upon a Mattress that year. She was charismatic and a pleasure to watch on stage. 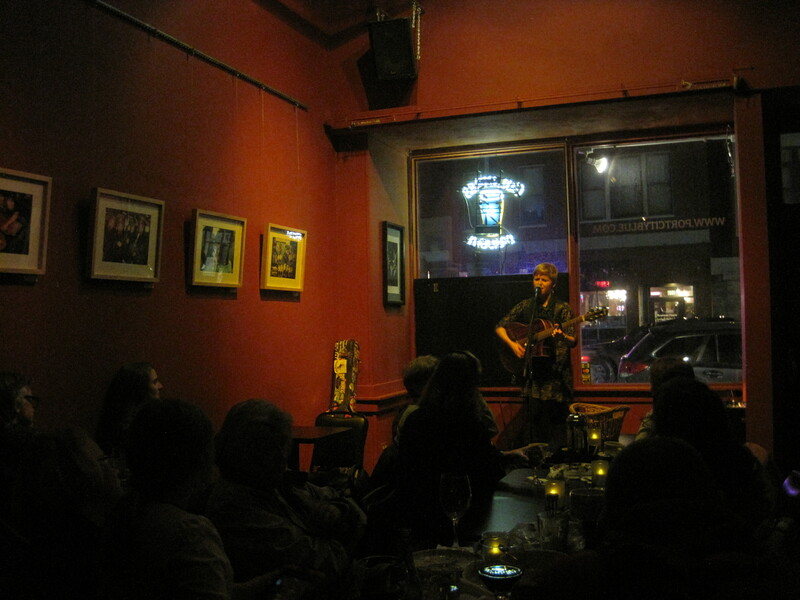 I’ll never forget how blown away I was when Genny played a song at one of the open mic nights I hosted at Mt. Ararat during her senior year. 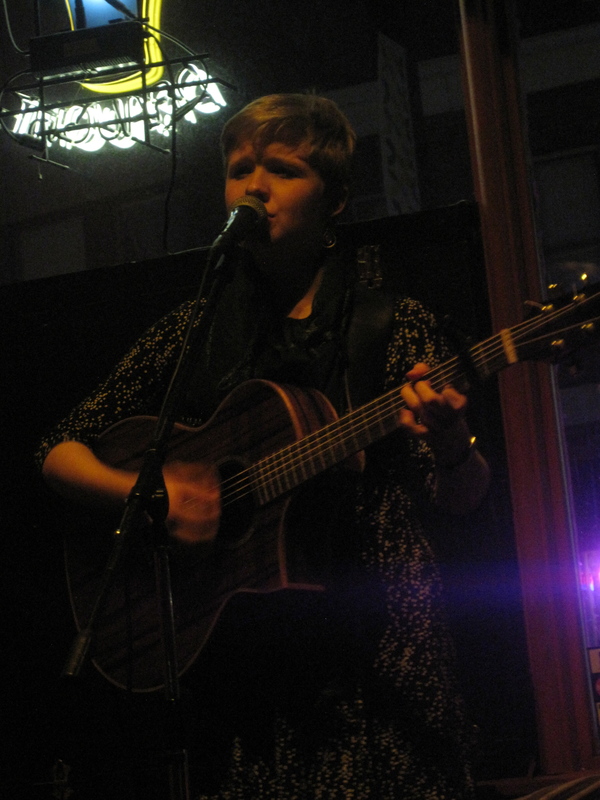 She fingerpicked an acoustic guitar with ease and I was impressed by her strong voice. At the end of her performance, I asked her who wrote the song. When she said that she had, I didn’t believe her at first. It showed wisdom beyond her years. 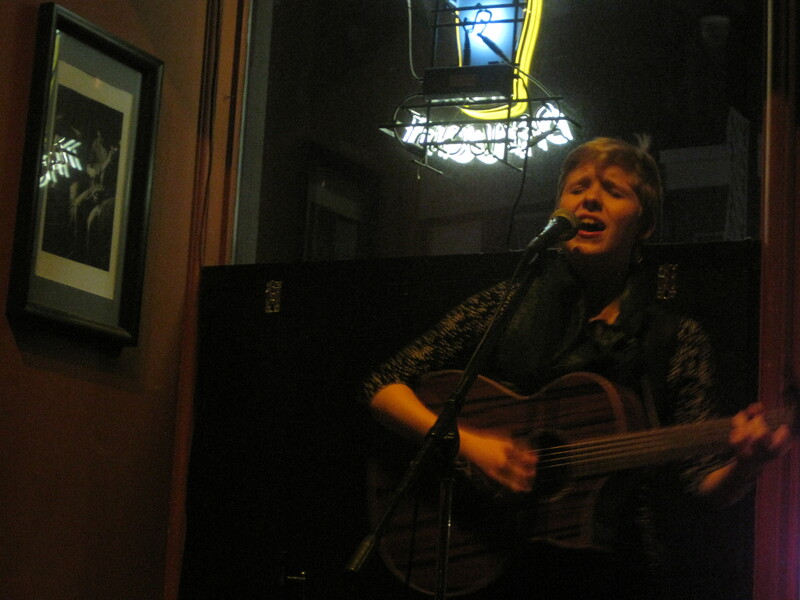 All grown up now, Geneviève Beaudoin is a student at NYU and an up and coming singer songwriter. In her first year at NYU, she performed in and won her dorm’s talent show which gave her a spot in NYU’s talent showcase. Here’s where it gets interesting—Lady Gaga once lived in the same freshman dorm and also performed in and won the same dorm’s talent show. Through the transitive property, Geneviève is on her way to extraordinary stardom! “Geneviève Beaudoin is 19 but she’s not young. The budding singer-song writer has been shaped by a vibrant family–half American, half French—and has learned from different homes in Lyon, France; New York, New York and a small town in rural Maine. To that end, Geneviève’s original songs are raw, multi-faceted, and mature. With their perception and poetry, her lyrics reflect a solidified spirit—and the voice that sings them is one skilled beyond others of her years. 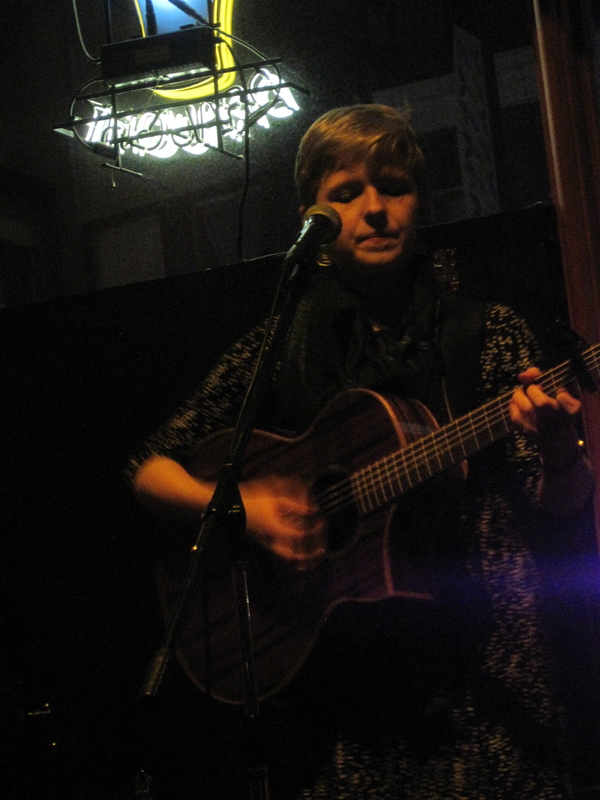 Her folk and blues compositions are at times playful and witty; other times, achingly poignant. Regardless of its emotion, though, or the language in which it’s sung, Geneviève’s art is always stirring. I got to Blue in Portland a little before Geneviève’s set. It was great to see her while she was home on break and to catch up with her dear friend Mary and her delightful family—even her dad, who went to Colby. (No hard feelings, John!) Geneviève introduced me again to Dietrich Strause who was playing after her. I saw him open for Ben Sollee at One Longfellow Square back in August. Dietrich is very good and I wish I’d been able to stay for his set, too. “Go On,” which Geneviève wrote with her friend Kate on the quad at Bowdoin College—my alma mater! “Selfish Mind,” which is the first song Geneviève ever wrote. It was for her high school sweetheart essentially declaring her love for him. He eventually told her he didn’t like the song and they broke up shortly after. This is the song I heard Genny play at open mic night her senior year, so I was one of the first lucky people to hear it. It’s full of wisdom. “Settling” was dedicated to Geneviève’s mom (it’s her favorite) who sang along from the audience. It was adorable. “I Could,” which featured some great guitar thumping percussion. 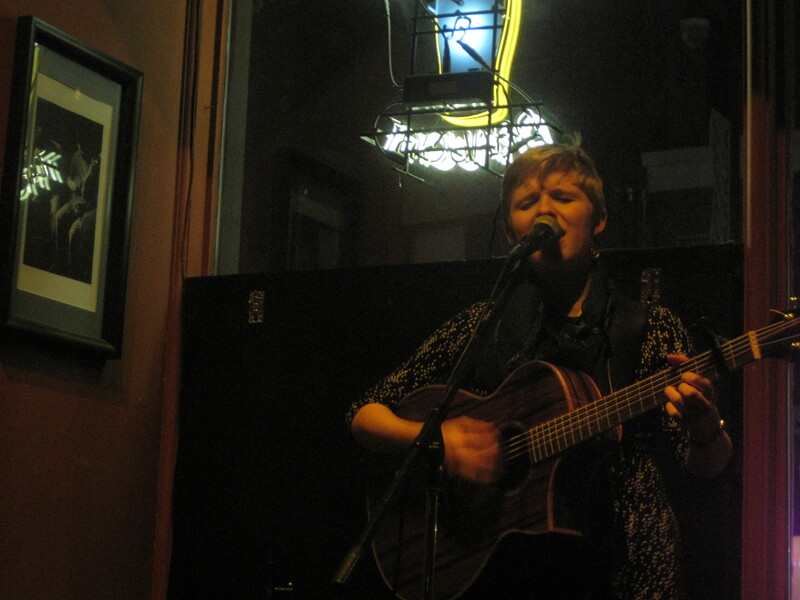 “Fatigue,” which is a new song Geneviève called a work in progress, but was perhaps my favorite song of the night. It was inspired by the short film, Destino. By the end of her set, I’d written down and then underlined (twice) “NOT 19 years old!” Geneviève’s songs are mature and wise despite her youth, and she is such a pleasure to see live. You can keep in touch with her on her Facebook page (where she graciously promotes this blog! ), her website, or on Twitter. Definitely don’t pass up the chance to see Geneviève live. Genny—thanks for such a lovely evening! Can’t wait to see you again soon!